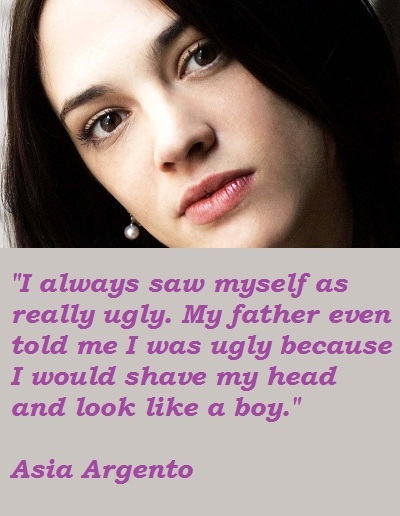 See the gallery for quotes by Asia Argento. You can to use those 7 images of quotes as a desktop wallpapers. Having been a child actor, I remember how directors would trick me to get good performances out of me. I don't think you need to do that. I have nothing in my life besides my work. I am obsessed with it. I leave my house only when I'm forced to. I always saw myself as really ugly. 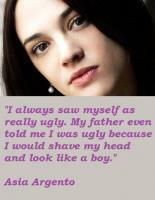 My father even told me I was ugly because I would shave my head and look like a boy. I tend to be a lazy actress, unless I'm pushed. I was made for action movies. Most of the time nothing much is required of directors, which is a pity. What you might see as depravity is, to me, just another aspect of the human condition. Vin Diesel is the best kisser in the world, better than anyone else I've ever had. The most attractive thing about Vin is his brain. That's his most attractive muscle.